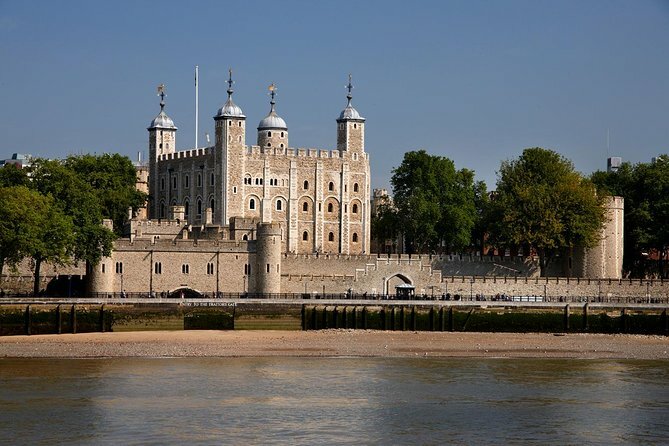 Home to the Crown Jewels, the Tower of London reverberates with dark secrets, where priceless jewels glint in fortified vaults and pampered ravens strut the grounds. Founded by William the Conqueror in 1066, and enlarged and modified by successive sovereigns, the Tower of London is one of the world's most famous and spectacular fortresses. Discover its 900-year history as royal palace and fortress, prison and place of execution, mint, arsenal, menagerie and jewel house. The best way to see the sights and splendor of this great capital city is from the deck of a boat. The River Thames weaves its way through London, with history around every bend. You'll experience the sights and splendor of this great city from the comfort of a modern, all-weather, wheelchair-friendly RiverLiner, with open upper decks and spacious lower saloons with panoramic windows. Take advantage of two bars providing light refreshments, snacks and alcoholic beverages. Cruises depart frequently from Westminster Pier, Waterloo (London Eye) Pier, Tower and Greenwich Pier. The shortest trips between piers last around 30 minutes, while the full round trip takes 2.5 leisurely hours. A surprise trip for sisters Birthday and an 8 year old boy, freedom to plan own day, went down to Greenwich, a worthy trip, fun commentary on the boat and just an excellent experience, undoubtedly assisted by the weather being amazing as well. This was a GREAT excursion. We had no idea how cool the Tower of London is! Plan ahead to spend several hours, if not more, once you get into the grounds of the Tower of London. Really, really interesting. We saw the Crown Jewels and took a walking tour once inside. The history is fascinating! The River cruise was really enjoyable. Our tour guide, Dale, was so funny. This was a really good value for our excursion budget and one that stands out as a favorite. Really enjoyed both the Tower of London and the River Cruise! Not sure that it saved any time getting this package in advance since you have to go get your tickets down at the dock first and then go back and get in the regular line for Tower of London tickets. I didn't double-check the cost-savings of the package either. Taking the River Cruise was especially nice to see several sites in one-shot. Ride down to see Westminster Abbey and Big Ben and walk over to Buckingham Palace and Jewel Tower. Pass by the London Eye and the Shakespeare's Globe Theatre. Had wonderful weather and the cruise was a blast! Good views and picture opportunities everywhere. Tower of London has as much to do or take it easy and only do some of the many venues. Everything is clearly mapped out and there are opportunities to amuse children everywhere. Sightseeing tour was great, however there is no point in purchasing tickets ahead of time if you had to wait in a 20 minute long line to then convert your barcode to another ticket and the kiosk machine was broke. everything worked out well for our tower of london tix and cruise, however the logistics were a little confusing. After walking up to counter as instructed, it took us three times to get the correct amount of tix for 10 people for both the tower and the cruise. And no one ever mentioned that we had to physically go to another counter to get the actual tower tix. nothing was very far from the tower but it was tedious and time consuming. but the cruise was lovely and we saved the planning everything ahead of time. I would recommend utilizing this package because it was nice to have everything organized beforehand, but please be aware of the additional steps and to count your tickets for everything.